REEL 1 Background in Hull, GB, 1920-1936: family and area grew up in; leisure activities as child; education; work as apprentice painter and decorator; reason for leaving job; joining of boy scouts; uniform; activities at meetings; discipline; annual camp; work with LNER; reason for leaving job; story of holidays in Blackdown; process of joining army; medical. Aspects of period as boy musician with 1st Bn Durham Light Infantry in GB, 11/1936-11/1937: musical background; wait for call-up; uniform and equipment issued; accommodation; sleeping arrangements; storage of kit; heating; cleaning of barrack room; description of a bumper; corporal in barrack room; army attitude to gambling and smoking; polishing of equipment and boots; inspections; Blanco; method of cleaning buttons; ironing of uniform and method of keeping trousers creased. REEL 2 Continues: method for polishing boots; muster parade; kit inspections; consequences of losing items; theft among boys; details of pay; NAAFI canteen; coping with life in barracks; medical after joining battalion; memories of Lieutenant Colonel Grey-Wilson; make-up of band; interview with bandmaster and allocation of B Flat Clarinet; daily practice; inclusion in band; discipline and common misdemeanours; cleaning of clarinet; NCOs in band; morning procedures; morning activities and break; lunch; afternoon and evening activities; rations including description of dining room and serving of meals; earning of extra money for canteen; army education; increases in pay; learning of regimental history and pride in unit; marching at Light Infantry pace; foot drill; details of leave; reception from parents when on leave; weekend passes; REEL 3 Continues: leisure activities including restrictions in leaving camp; punishments; engagements of band; band fund; ownership of instruments; dance band; church parades; organisation of band programme; band dress uniform; joining of full band; weapon training; rifle drill; route marches; turning 18; khaki drill issued for foreign service; wearing of puttees; reaction of going abroad; embarkation leave and reactions of parents to his posting abroad; medical and inoculations; Aspects of journey from Southampton, GB, to Shanghai, China, aboard the Dilwara, 11/1937: journey to Southampton; bands on quayside and deck; details of ship; accommodation and sleeping arrangements; storage of hammocks; cleaning of ship; activities during voyage; lectures; activities during stop-offs; morning procedures; physical training; member of others units onboard; discipline including cleaning of eating utensils; activities on mess deck; rations; canteen; commanding officer; length of journey; decision to leave boys in Hong Kong; opinion of journey. REEL 4 Continues: 2nd Battalion troops collected at Port Sudan. Aspects of period as boy musician and private with 1st Bn Durham Light Infantry in China, 12/1937-12/1939: first impressions of Shanghai; civilians; situation with Japanese; accommodation in school; sleeping arrangements; description of barracks moved to; band duties; sports played; stretcher bearer training; St John's Ambulance Brigade exams; duties as stretcher bearer; 18th birthday and conversion to adult bandsman; changes to life as adult including pay; reasons for not leaving camp much; VD warnings; army attitude to VD; engagements of band including relationship with Seaforth Highlanders; contact with troops of other nations; visits to Foreign YMCA; contact with English civilian population; perimeter guard duties; reactions to Japanese bombing of shipping; route marches; contact with American Marines; rations; posting in Tientsin; duties including river patrol to Tsingtao; role of battalion; situation for civilians; winter conditions and band duties; death of Corporal Scott; mail; declaration of absence of sensitive information. REEL 5 Continues: signs of approaching war including preparations being made by battalion; reactions to situation; reason for floods in Tientsin and approach of wave while on patrol; weapons carried on patrol; manning of emergency positions; rising of water and move to higher floors; evacuation of battalion to warehouse; continuation of duties; company left in barracks; conditions in warehouse; anti-malaria precautions; cleaning up of barracks; loss of kit and personal items; reaction to loss; outbreak of war; signs move was intended; activities of Italian troops; disappearance of warships from river; journey to Hong Kong. Aspects of period as private with 1st Bn Durham Light Infantry in Hong Kong, 12/1939-1/1940: accommodation; physical training with "Crackers" May; Christmas 1939 and band duties; training; knowledge of destination; memories of Lieutenant Colonel Lysaght-Griffin and Major Goldschmidt; memories of Captain Fox-Davies; contact with rifle companies. Aspects of journey from Hong Kong to Egypt aboard the Talma, 1/1940: description of ship; seasickness; date of embarkation; knowledge of destination; lectures; knowledge of Italian troops; arrival at Port Suez. Aspects of period as private with 1st Bn Durham Light Infantry in Egypt, 1/1940-7/1940: accommodation in Port Said and Moascar; first impressions of Egypt; warnings given about civilian thieving skill; packing up of musicals; training; guard duties; move to Moascar; guards in Port Said; Italian entry into war and Italians interned including ship seized; internment camps set up; reaction of Italians. REEL 6 Continues: training received; duties as temporary officers mess waiter; preparations to move and description of Moascar garrison; acclimatisation; civilian workers in garrison; impressions of Egyptian officers; changes in battalion; memories of Regiment Sergeant Major John Bush and Quartermaster George Flanagan; comradeship within band; memories of Corporal Smurthwaite. Aspects of operations as private with 1st Bn Durham Light Infantry in Egypt, 7/1940-7/1941: posting in Mersa Matruh; air raid and posting in Regimental Aid Post; casualties; story of stretcher bearer awarded Military Medal; cover taken from bombs; reactions of troops to air raid; frequency of air raids and withdrawal of troops from barrack blocks; position of Regimental Aid Post; staff of post; duties at sick parade and problems with fleas; desert sores; cure invented for desert sores by Jock Lees; defences dug along ridge; description of Mersa Matruh; posting in C Company at Old Reeky; equipment carried by stretcher bearers and responsibilities on battlefield; armband; policy towards carrying of weapons; accommodation with company; company commander and sergeant major; opinion of company position; casualties, including death of a sapper; earlier warnings given about stretcher bearer work; first injury attended; acceptance of nature of work. REEL 7 Continues: processing of wounded troops; aid given by stretcher bearer; treatment for shock; reactions of wounded troops; supply of rations and water; water rations; cleanliness; opinion of supply situation; rations while away from base; more on water ration; climate; sandstorms; measurements and use of slit trenches; sand fly fever; precautions against ants and flies; latrines and hygiene; leisure activities; business of time at Mersa Matruh; censorship of mail; mail; terrain; peaceful period; Italian advance to Sidi Barrani; arrival and memories of Colonel Ardherne; news of operation; composite company formed with armoured cars and tanks; advance to wadi; dummy tanks constructed; dysentery in company and effects of it; advance in column; initial attack of armoured cars; arrival of Italian POWs; movement into Sidi Barrani; later actions of composite company; posting in Guards Brigade at Qassassin; exercises; Libyans fighting among Italians; relationship with Guards; landing training; story of mortar base plate lost in sea. REEL 8 Continues: landing craft including crew; disembarkation; difficulties found and overcome; arrival of Germans and return to Mersa Matruh; move to Sollum; posting of A Company to Bardia; description of area around Sollum; positions occupied by Axis and British troops; mortar being received; role of Fort Capuzzo attack; promotion to Medical Officer's batman; position in rear; formation of advance; activities during battle; events of battle; actions of Colonel Adherne during battle; arrival of casualties at Regimental Aid Post; work at Regimental Aid Post; garlic powder stored nearby; treatment of wounded; work of padre; appearance of confusion; actions and reactions of patients; withdrawal from Capuzzo; discussion of battle; defensive line formed behind attacking force; noise of battle; automatic nature of individual's actions during battle; rear transport ready for emergencies; withdrawal of Regimental Aid Post; tiredness and reactions following day; treating of friends; fear of being overrun and plans if happened; medical supplies; withdrawal to Buq Buq; dates of battle and arrival in Buq Buq. REEL 9 Continues: administering of morphine at Fort Capuzzo; marking of patients; reinforcements; reorganisation of battalion; needs after battle; morale; reactions of troops toward failings at Capuzzo; talks from company commanders; leave situation; importance of rations; journey to Merdjayoun via Kantara. Aspects of operations as private with 1st Bn Durham Light Infantry in Syria, 7/1941-10/1941: situation in Syria; composite brigade fought with; spread of battalion; position of Vichy French; shelling; terrain in area; capture and treatment of Corporal MacDonald; advance of battalion; relationship with civilians; rations; camp set up in mountains; climbing of Mount Hermon; signing of armistice; postings in Aleppo and Idlib; accommodation; contact with civilians; return to Egypt; role in battalion; embarkation from Alexandria; voyage to Tobruk. Aspects of operations as private with 1st Bn Durham Light Infantry in North Africa, 10/1941-12/1941: arrival in Tobruk; march to wadi and welcome from Australians; relief of Australian troops in Blue Line; restrictions to movement during day; defensive positions; role of patrols; terrain; German positions; observation towers; description of defensive lines; reactions to Stuka raids; defence of positions; layout of minefield; position of Regimental Aid Post; sleeping arrangements; rations. REEL 10 Continues: visit to forward positions with battalion commanding officer; memories of John Kirby; contact with flanking units; casualties; state of Tobruk; location of Field Hospital; opinion that would not have survived without Royal Navy; rations; supply of water; inactivity at Tobruk and toughness of front line troops; D Company attack on Plonk; actions of Private Temple; state of wounded; medal awards; attack on Point 157; role during attack; improvements made following earlier attacks; casualties; morale; bayonet attack; assistance given to Royal Engineers; expectation of further action; movement back to Egypt; reactions to posting. Aspects of period as private with 1st Bn Durham Light Infantry in Egypt, 12/1941-1/1942: leave in Cairo and Alexandria; warnings about and treatment of VD; precautions issued; army attitude to VD and punishments; bars and brothels for different ranks; base troops; march from El Tahag to Qassassin; roll call at Qassassin and troops losing rank. REEL 11 Continues: reason for march; return to Moascar barracks; news of posting to Malta; opinions of other commonwealth troops; preparations for journey to Malta; voyage from Alexandria to Malta including German attacks; arrival in Valletta. Aspects of period as private and NCO with 1st Bn Durham Light Infantry in Malta, 1/1942-6/1943: knowledge of Malta; disembarkation; journey to Rabat; accommodation; spread of battalion; terrain and restrictions on training; situation and role on Malta; issue of bicycles; drill with bicycles; duties; building of sangers on airfield; working hours; air raids; casualties; help given to and relationship with RAF; protection of important sites; accommodation; rations; water supply; heath and fitness of battalion; hygiene; accommodation of A Company; relationship with civilians; pro-Italian feeling among civilians; visits to Valletta; rest camp at St Paul's Bay; sports played; memories of Colonel John Kirby; visits of senior officers; business of period; difference with situation in Tobruk. REEL 12 Continues: discipline; plans for raids on Sfax and Sousse; emergency rations issued; cancellation of raids; return of emergency rations; discovery that some emergency rations had been eaten; accused of doing so; refusal to accept punishment; placement under close arrest; court martial; sentence given; reduction in sentence granted by Brigade; fellow prisoners; theft of battalion rations while in jail; reveille; working parties sent out from stockade; extra rations and reactions to confinement; explanation of close arrest; lecture from Regiment Sergeant Major on release; period in Headquarters Company helping clerk; success on weapons training course attended; posting to C Company and promotion to Lance Corporal; details of weapons training course; increase in pay on promotion; opinion of Thompson Sub-Machine Gun; reflections on transition from stretcher bearer to rifle company; opinion of company commander Major "Topper" Brown; organisation of C Company and platoon posted to; role of section; details and opinion of Bren gun; roles of two number one and two gunners; ammunition carried by section; role in section; cleaning of gun and magazines; voyage to Egypt including sinking of a POW ship; 8th Army's progress; offensive activities from Malta; lifting of siege on Malta. Aspects of period as NCO with 1st Bn Durham Light Infantry in Middle East, 6/1943-9/1943: journey to Syria via Palestine; invasion and mountain warfare training; method of carrying equipment up mountains; camp at Afula; knowledge of destination. REEL 13 Continues: conditions in camp; flight to Kos in Douglas Dakotas; news of destination and talk from Colonel Kirby. Aspects of operations as NCO with 1st Bn Durham Light Infantry in Greece, 9/1943: arrival of rest of battalion; move into Kos Town; weapons taken; knowledge of role; reception from civilians; arrival of other rifle companies and aircraft lost en route to Kos; proximity of Kos to Turkey; activities of C Company and other rifle companies; accommodation; atmosphere in battalion; defensive positions taken around town; opinion of positions; rumours during quiet period; cessation of supplies; air raids; destruction of Supermarine Spitfires on island; concerns about situation; air cover and support; supplies from air and flare paths created for drops; cessation of supplies from air; rations; arrival of German assault; occupation of defensive positions; landing of paratroopers; return of Colonel Kirby from hospital; German occupation of airfield; withdrawal of rifle company into Kos Town; offer of Major Jim Grey to occupy Italian field gun; approach of battle sounds and attacks from air; ration and ammunition supplies; ratio of German to British troops; calling of Order Group to discuss future action and mortar attack killing Regiment Quartermaster Sergeant John Bush; other officers wounded; rumour of a bayonet charge; orders to adopt escape and evasion tactics and explanation of tactics; ammunition situation; issue of rations; reactions to situation; movement across mountains heading for north of island; use of gas cape for camouflage; attacks from Stukas on pillbox and Kos Town; reaching of north side of Kos; size of party and troops lost en route; last sight of Beagle Birchenough; terrain in area; decision to search for way off island; reason for abandoning plan; knowledge of possible help in evacuation. REEL 14 Continues: lack of signs of other parties; side of island facing Turkey; search for place of concealment led by Lieutenant Bob Smith; entry of deep ravine; German reconnaissance plane sighted; remaining rations; search for water; hiding of heavy equipment; movement until dark; weather and keeping warm; morale; Council of War and decision to retrace steps to seek food; burst of fire from German patrol boat; scattering of party; cover taken; group that surrendered; wait and checks boat was gone; events and decisions made during day; search for shelter in direction of Kardamena; advantages of being in a smaller party; effects from not eating; accommodation; lighthouse and ferry on Turkish coast; morale; opinion of Lieutenant Smith; search for sheep; appearance of an RAF officer; raft RAF officer had begun work on; appearance of a sheep and opinion of its source; butchering and eating of sheep; hiding of rifles; knowledge of RAF officer's identity; morale; story of RAF officer's escape; dragging of raft to accommodation; plan to complete raft including items used to fasten wood together; sleep and rations on third day; completion of raft; day resting in hut; size of raft. Aspects of voyage from Kos, Greece, to Turkey, c9/1943: weather and conditions for voyage; oars; reason he was fastened to mast; water on raft; time left Kos; prayers of Corporal MacDonald and Private Guy and reaction of RAF officer. REEL 15 Continues: thoughts upon embarkation; helpful elements during voyage; temperature and currents of water; stories and songs; thoughts of food on arrival; knowledge of Turkish attitude; state of raft in morning; problems with current; officers swam to shore; current taking raft to shore. Aspects of period in transit, 9/1943- 10/1943: rest on beach; disintegration of raft; physical condition; appearance of Turkish man and handing over to police; accommodation given at police station; meal eaten in evening; appearance and state of clothing; transportation to Bodrum; morale and clothing given en route; handing over to Special Services officer and reception from civilians in villages; reception from landing craft crew; overall attitude of Turks; new uniforms given; period with SAS unit; insistence of Bob Smith the party was kept together; length of time in Turkey; voyage to Kyrenia in Cyprus; reunion with other escapees; news of fate of rest of battalion; survivors arriving two days later; reactions to situation; tales of other's escapes; opinion SAS had planned rescue missions well; payment of Greeks for their hand; reorganisation of battalion; voyage to Syria. Aspects of period as NCO with 1st Bn Durham Light Infantry in Egypt, 10/1943-4/1944: journey to tented camp at Mena; reinforcements; rumours of destination; posting in 10th Indian Division; Durham Light Infantry drafts received. REEL 16 Continues: training; Irish reinforcements; command of battalion and memories of Colonel "Crackers" May; actions taken against Greek Brigade mutiny at Amirya; training with Sherman tanks; opinion of Shermans; opinion of I tanks; tanks worked with at Tobruk; voyage to Taranto. Aspects of operations as NCO with 1st Bn Durham Light Infantry in Italy, 4/1944-6/1944: state of Taranto; joining with 10th Indian Division and relief of Manchester Regiment; movement of positions away from shellfire; connections of battalion with India; make-up of division and settling into division; nickname given; opinion of Indian troops; reserve position taken at Sanvenetto; activities in position; arrival in and description of Venaffro; street fighting training including German withdrawal tactics; completion of seven years overseas; wounding from grenade during training; evacuation by "Crackers" May to Field Ambulance; description of grenade explosion and wounds; concerns would lose leg; reactions to being wounded. Aspects of hospitalisation in Italy, 6/1944-11/1944: discipline during earlier hospitalisation in Shanghai; discipline and staff in Naples hospital; problems with healing of hole in leg; treatment received; course of physiotherapy; movement to convalescence camp in Bari. REEL 17 Continues: opinion of hospital staff and rations; requisition of hospital; visitors received; treatment; length of time in Naples hospital; ongoing problems from leg; convalescence in Bari; interview at transit camp and reason for being sent to GB; conditions in transit camp; work as postal orderlies and accommodation; voyage to Liverpool. Aspects of period as NCO with Durham Light Infantry in GB, 1944: reactions to return home; mail during time abroad; first impressions of Liverpool; arrival in port; journey to Hull; welcome from parents; activities during leave including period of gloom and reactions of parents; posted to Brancepeth Castle; reaction of parents to return to army; rank in Italy and removal of stripe; activities at Brancepeth; posting to training division. Aspects of period as NCO with 6th Bn West Yorkshire Regt, 11/1944-11/1945: interview on arrival with unit; promotion to sergeant; length of time with unit; VE Day party at Porthcawl; reactions to end of war; ex Durhams in West Yorkshire Regt; opinion of war experience; opinions of higher ranks in army. REEL 18 Continues: memories of officers served under throughout career; opinion of what makes a good officer; examples of bad officers; memories of Sergeant Foster and Corporal Tim Scully; memories of Fishwick; discussion of different NCO ranks and qualities needed; qualities disliked in an NCO; memories of outstanding characters; running of a section in action; story of dealing with Private Snooks' refusal to carry out orders; mood and comradeship of troops; opinion of German troops; opinion of German weapons; opinion of Italian troops; booby traps at Sidi Barrani; German booby traps and booby trap course taken at Ripon; description of German S mine; account of Private Elliott kicking a booby trap; opinion of booby traps; fountain pen and soap booby traps; booby trap training given to troops; religion before and during army service. REEL 19 Continues: discussion of padres and story of drunken padre in Tobruk; use and issue of rum; importance of presence of medical services; memories of Major Lees. Aspects of period as NCO with 6th Bn West Yorkshire Regt in Italy, 11/1945-1/1946: arrival in Naples with West Yorks; accommodation in Salerno; duties; talk with Durham Light Infantryman at railway station; request to rejoin 1st Battalion; reunion with battalion in Tarranto; posting in C Company; changes in battalion; search for Durham Light Infantry reinforcements. Aspects of period as NCO with 1st Bn Durham Light Infantry in Greece and GB, 1946-1947: story of parade; voyage to Greece; conditions including on journey to Xanthi; situation and role in Greece; description of Xanthi; settling into barracks; location of officers mess; accommodation of NCOs; latrines; relationship with civilians; accommodation of B Company; training including rifle range constructed; activities of Communists; guard duties at Kavala; camp set up and put in charge of; discipline; battalion commanding officer; promotion to Warrant Officer Class II; duties as Company Sergeant Major; rank insignia; send-off from Greece; time in transit camp in Salonika; father's illness and death; pay kept by mother in his name. REEL 20 Continues: activities of battalion at Monkton Farleigh; embarkation leave; accommodation; news of posting to Dortmund in 2nd Division Rhine Army; formation of battalion including make-up of support company; journey to Dortmund. Aspects of period as NCO with 1st Bn Durham Light Infantry in Germany, 1947-1952: role of battalion; attitude of civilians to army; ladies invited into sergeants mess; state of railway stations and towns in Germany; accommodation; duties; contact with Royal Artillery troops; sports; length of time in Dortmund; posting of B Company as advance party; memories of Major Glanville; relief of Manchester Regiment; duties in Berlin; Berlin flash; sporting facilities; ceremonial drills; memories of Peter de la Billiere aka Eddie Smith; relationship with civilians; reinforcements; opinion of National Servicemen; guard on Spandau Prison; Russian sector; British sector; black market; more on relationship with civilians; morale; memories of stay in Germany; Inter-Company Boxing competition and news of posting in Korea; return to GB. Aspects of period as NCO with 1st Bn Durham Light Infantry in GB, 1952: time in Barnard Castle; training on North Yorkshire moors and march from Bishop Auckland to Brancepeth Camp; opinion of training; use of Patchett machine gun in Korea; commitment to army and reaction to posting in Korea; reaction of mother to posting. REEL 21 Continues: composition of battalion including equipment not taken; uniform and equipment issued for Korea; trial of severe climate equipment in Germany; weapons taken to Korea; changes made to Lee Enfield rifle; details of voyage to Korea; send-off from Southampton; activities on journey; posting in C Company and commanding officer. Recollections of operations as NCO with 1st Bn Durham Light Infantry, 29th Commonwealth Infantry Bde in Korea, 9/1952-5/1953: reception on arrival in Pusan; disembarkation and boarding of train; scenes from train; conditions on train; medicals and inoculations in Barnard Castle; arrival in reserve area; lectures; seasons in Korea; description of camp; training in practice trench; arrival and work in reserve lines; situation in lines; frontline activity during day and night; routine in evening; types of patrols; story of standing patrol; duties as Company Sergeant Major; opinion of arrangement of having 2nd in command at B Echelon; cleaning of trenches; problems with rats; disposal of rubbish; periods of sleep; strain from periods in frontline; making most of living conditions; sleeping arrangements. REEL 22 Continues: importance of health and medical inspections; decision to avoid tinned rations; cookhouses created in bunkers; supply and storage of rations; rations; different nation's preference in terms of rations; praise for platoon commanders' willingness to cook; latrines and hygiene; health of battalion; contraction of fever; widening of trenches to evacuate wounded; evacuation of wounded; respect of Chinese for removal of wounded; description of trench system; width of different types of trenches; modification of new positions; length of time before in frontline; process of relieving troops in line; story of being relieved by American troops; proximity to Chinese positions; troops on duty during day; communications; Stand To at dawn and dusk; regularity of patrols; planning and briefing of patrols; role of patrols; details of different types of patrols; camouflage including its removal; orders to shave daily; clothing worn on patrol; weapons taken on fighting patrols; visits of Peter Jeffreys and effect on morale; mortar and artillery support. REEL 23 Continues: communication with supporting units and display of artillery's might; tank support; relationship with tank crews; involvement in attack on a position called John; story of help given to an Australian fighting patrol; different positions occupied by battalion; story of grenade set off in lines; periods of rest; discipline; Christmas 1952; Christmas cards sent by Chinese; post box set up for cards; opinions of troops from other nations; creation of artificial moonlight. Aspects of period as NCO in Japan, 5/1953-8/1953: posting as Camp Sergeant Major to Kure; reason for posting; commanding officers; length of time in Kure; duties and leisure activities; posting in advance party to Egypt. Aspects of period as NCO with 1st Bn Durham Light Infantry in Egypt, 1953-1955: situation and role in Egypt; camp based at; posting in 1st Guards Brigade; guard duties; other activities of battalion; entertainment of Royal Navy; interview with "Crackers" May and new posts offered; voyage aboard Troopship Lancashire; arrival and disembarkation in Liverpool. Aspects of period as NCO with Durham Light Infantry Depot in GB, 1955- 1957: arrival at Barnard Castle and leave; start of post as Depot Sergeant Major at Brancepeth Camp. REEL 24 Continues: role of depot and request from "Crackers" May; company commander; routine of camp; background of recruits; training platoons; sport; length of time at depot; request for Warrant Officers to serve in Oman; story of General Furbank's visit and promotion to Regiment Sergeant Major; period with 1st Battalion at Barnard Castle; pressure to cancel post in Oman; flight to Oman. Aspects of period as NCO with Trucial Oman Scouts in Oman, 1957-1958: welcome from Colonel John Carter; climate; enjoyment of tour; flights in aircraft; quality and recruitment of Scouts; background of officers and instructors; teaching of Light Infantry pace; transport; boys unit; daily routine; RAF detachment; role as Regiment Sergeant Major; details of pay; time at Brancepeth; postings with 1st and 4th Bns King's Shropshire Light Infantry; process of discharge; final medical; request to become military instructor in a public school; decision to return to Hull; job gained; method of leaving depot on last day; details of pension and terminal grant. Aspects of period as civilian in GB from 1961: difficulties settling back into civilian life; civilian work; retirement; attendance at reunions; membership of comrade associations; qualities of the Durham soldier; praise received from General Montgomery. The Berlin Airlift was the first major confrontation between the East and the West during the Cold War. It was known as Operation 'Plainfare' by the British and Operation 'Vittles' by the Americans. 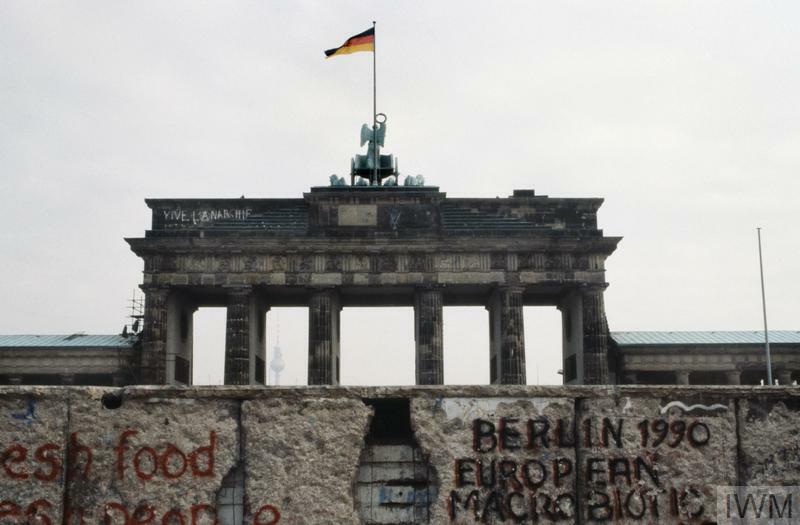 On 9 November 1989, government spokesman Gunter Schabowski announced at a press conference that every citizen of East Germany would be allowed to travel to the West, effective immediately. Submarines played a key role in operations throughout the Cold War. Commodore Frederic Thompson, kept himself and his crewmates entertained, by creating ‘radio’ programmes, which were then broadcast over the submarine’s internal speakers.